Native to South America, Organic Acai Berry is consistently named as one of the top ten super fruits on the planet. The snap freezing process of our source of berries takes place at a facility close to where the Acai Berries are picked, which allows the Acai to retain its nutrients, making it a great wholefood with a good fat profile and high ORAC value. This is due to the antioxidant rich level of anthocyanins. The anthocyanins are known as flavonoid pigments, and they are what give red and purple fruits and vegetables their rich colouration. Anthocyananins are what make red wine red – and Acai Berry has 10 to 30 times the anthocyanin concentration of red wine and 42 times the antioxidants of blueberries. Available in 100g packs and bulk buy discounts. 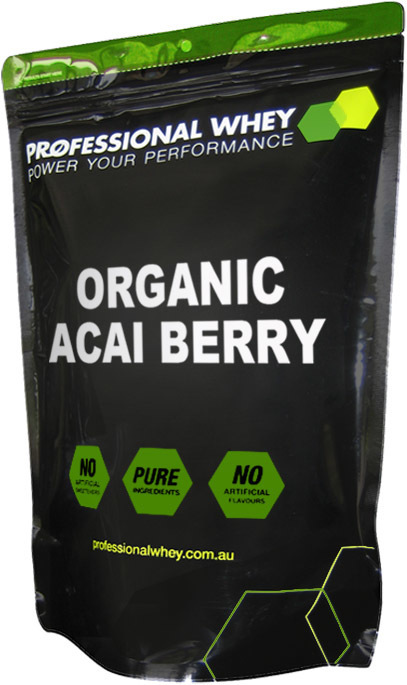 Add Organic Acai Berry to a protein shake, yoghurt or dessert. I mix it with the Maca Powder, Raw Cacao Powder and Egg White Protein Powder all from Professional Whey, together with half an avocado and ½ can of Coconut Milk and voila, a delicious "chocolate mousse" for breakfast. I've found Professional Whey products to be very competitively priced and good quality. 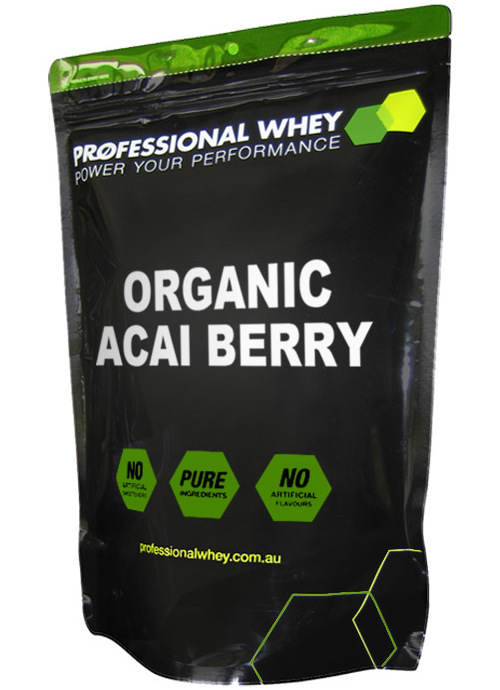 I’ve been aware of the benefits of Acai berries for a while, but only recently discovered that they are available here in Australia through Professional Whey. The berries come in powdered form and have a delicious, slightly tart berry taste — a bit like a mixture of blackberries and redcurrants. The powdered Acai berries mix up well in a fruit-flavoured protein shake, and because you need to use only a heaped teaspoon, they are very economical. Very useful - but note this is a powder. Pro - add to a shake to increase it's fat content, extremely useful when following a zone nutrition plan. - doesn't have any overpowering taste or smell - very potent so only a small amount is required to get benefits. Con - I was expecting the bag to contain the berries, but it contains powder. Up until recently my breakfast fruit and vegie shakes included a helping of fresh berries for that anti-oxidant burst. But in winter berries become very expensive so I started looking for an alternative in advance. And here it is. It's so good in my smoothie that now I'm holding back my summer berries for fresh eating, which, let's face it, is much more enjoyable! Great product....add to cereal, shakes, yoghurt....delicious!